Image: The Star website. The new Sky Terrace lounge. Sydney, we're getting some cool bars to pick and choose to chill out in style at. One of Sydney's premier entertainment destinations opened up a rooftop bar in late 2012. Where is the best rooftop bar in Sydney? The Glenmore Hotel in The Rocks has a great rooftop bar. It's the 180 degree Sydney Harbour and CBD views that make it special. They also have good pub meals and all the usual drinks you'd expect. 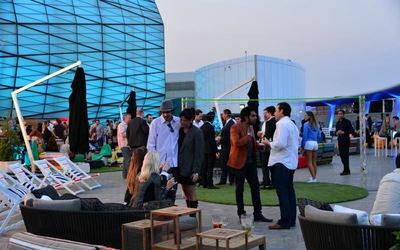 I heard somewhere that The Glenmore rooftop has had a make-over in recent times... must go along and check it out! I've heard that too, but haven't been since. I did have a look at their website and it does look pretty different now - and I mean that as a good thing! Have had a spectacular time at the Sky Terrace Rooftop Bar (lounge) at The Star. You can buy some great grub here too. Pulled pork belly roll for $5 is awesome value. Priceless harbour views and a midori lemonade...what else could you want?? The Rook on York St. It's only been open for a year and serves amazing, interesting, interactive cocktails as well as a paired down menu full of delicious different foods. These include truffle fries and Lobster rolls which I haven't seen anywhere else in Sydney! Best way to celebrate Easter in Sydney? Best factory outlet in Sydney? Best outdoor kids playground in Sydney?